In today’s scenario, there are a huge number of mobile applications that are being available for the consumer – and it is always a challenge to get the right App that is best for the consumer, App that is secure and best for the smartphone as well. And the whole process of storing, managing and maintaining App has its own challenge as well. In order to address such a scenario, there is a new trend towards enabling usage of messaging BOTs. As the App world gets complex and difficult to manage – messaging BOTs are becoming the new platform to enable new age communication that is seamless and easy to manage. Moving forward, BOTs are set to replace mobile apps. Just as an example – WeChat, Line, Facebook, Slack and Telegram are messaging platforms that enable interaction with third-party services from within the messaging interface. Each of these platforms enable developers to build messaging BOTs to provide automated services through the messaging interface — Facebook M is a great example of such a service. Delivering unprecedented ease of use for the user community – powered with intelligent APIs, messaging BOTs can read and write messages just like a human would. BOTs can be programmed to carry out automated actions and deliver unique experience to the users. BOTs can both initiate action as well as respond to requests from other users. Bots are of different kinds, too; they automate conversations, transactions or workflows. “Imagine a situation where a bank has a BOT interacting with its set of customers or a Pizza corner BOT taking different set of orders from its customers – based on their selection etc. So in a BOT driven world – E-commerce BOTs can enable buying of goods and services. Food BOTs can order dinner. Content BOTs can share relevant content with multiple set of users. Workflow bots automate business workflows in sales, HR, operations, admin, finance, etc. 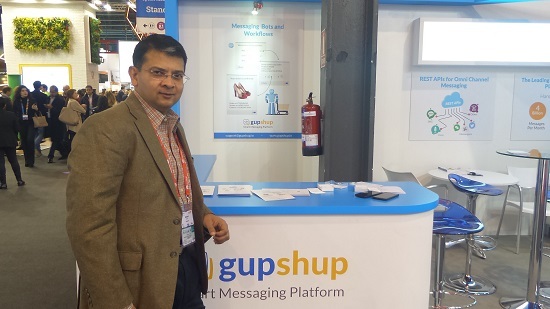 Chart BOTs summarize data in charts suitable for small screens,” explains, Beerud Sheth, Co-Founder & CEO, Gupshup on the sidelines of Mobile World Congress 2016, in Barcelona, Spain. “We focus on messaging, we have a smart messing platform, we provide developer tools to build, messaging BOTs, messaging services, and we are enabling this new revolution towards – the rise of messaging platforms and messaging BOTs. Messaging apps which are today just for person to person chats are tomorrow going to be used to build a wide variety of rich, intelligent and interactive services. So consumers will be able to do shopping, order food, also do banking, trading and make business decisions – all of that through your messaging app. Also on the enterprise side, companies will be able to do sales, CRM, HR, ERP, etc. It is a very powerful vision to enable next generation communications,” he added.